Off Page SEO or Internal linking both are same when it comes to Blogging. 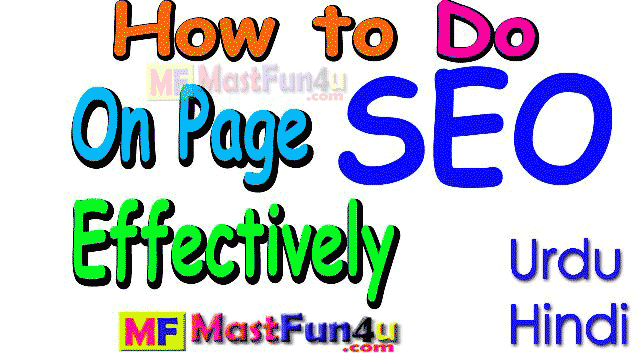 This is basically a technique to which is used to enhance the search engine result page (SERP). In the world of blogging when we link our website's one post or page to an other one it creates an internal link which is very important for search engine optimization and that is called off page SEO. SEO keeps the basic and essential importance when we are professional in blogging. This is the main technique which allows search engines such as Google, Bing, Yahoo and Bedu etc. to show our blog's posts into their search results. Traffic is very important for a blog or website. The term traffic means the page views which your blog is getting. It is therefore essential that if you want your business to be popular you will have to spread that now traffic is the only way to do that and for that purpose you need to do search engine optimization and off page is just one factor of that. In this post you might have seen links which are going to my other post and I think this is enough to know the importance of it. In our next post I will be describing about getting visitor to your site through social media sites such as Facebook, Google Plus and twitter where as two other videos for bringing visitor from Pinterest and Stumbleupon are made. It must be kept into account that if you have more visits daily then you will earn more from it. I have made other posts which tell about making money through Fiverr and Elance oDesk there we do not need to make any kind of links because that is not our site but we can get backlinks from there. The traffic coming from Search Engine is called Organic traffic and coming from other sites is called referral traffic. Dear you had better find responsive blogger template on google any blog may be customized. I can help you in customization if you find your self a template. Have you indexed your site in Google Webmaster? i m trying to creat account on alexa.com bt its says to edit info i have buy plan. can u pls help me .